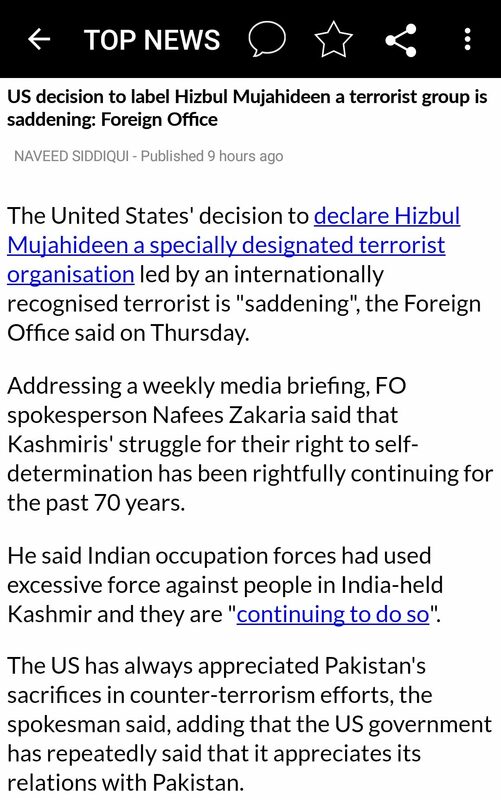 The United States has designated Hizbul Mujahideen as a Foreign Terrorist Organisation and Specially Designated Global Terrorist, less than two months after its chief Syed Salahuddin was designated a global terrorist. And the news is complete disappointment for Pakistan. The statement of the department said, formed in 1989, Hizbul Mujahideen is one of the largest and oldest terrorist groups operating in Kashmir. 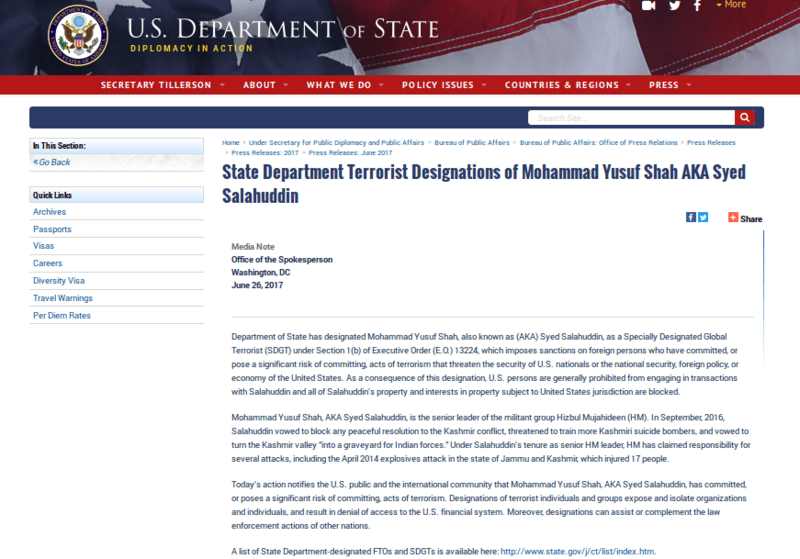 It is led by Specially Designated Global Terrorist Mohammad Yusuf Shah, also known as Syed Salahuddin. The tags aim to deny HM resources needed to carry out terror attacks. 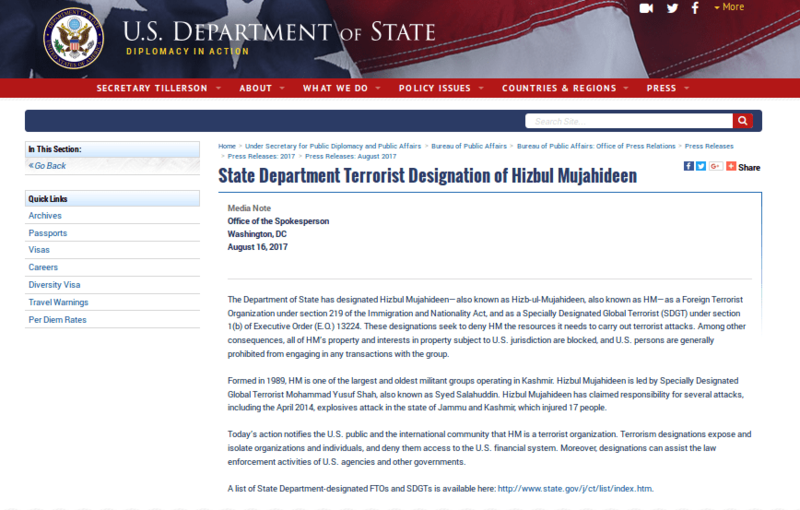 “The Department of State has designated Hizbul Mujahideen — also known as Hizb-ul-Mujahideen, also known as HM — as a Foreign Terrorist Organization under Section 219 of the Immigration and Nationality Act, and as a Specially Designated Global Terrorist under Section 1(b) of Executive Order 13224,” the US State Department said in a statement on Wednesday. “These designations seek to deny HM the resources it needs to carry out terrorist attacks. 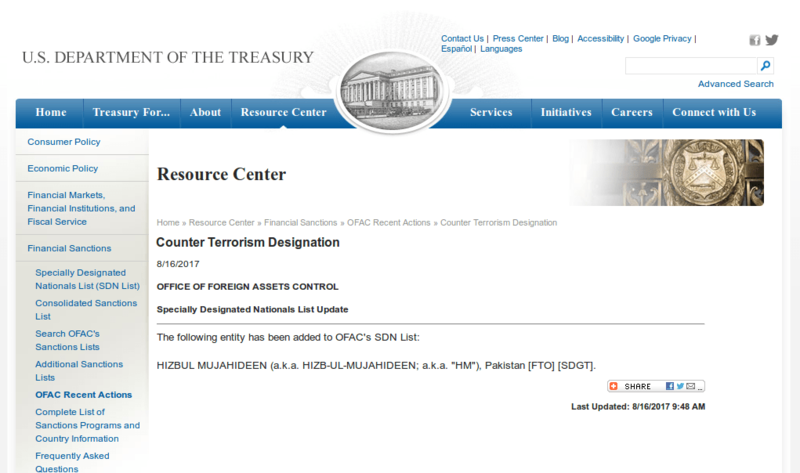 Among other consequences, all of HM’s property and interests in property subject to US jurisdiction are blocked, and US persons are generally prohibited from engaging in any transactions with the group,” the Department said. “Hizbul Mujahideen has claimed responsibility for several attacks, including the April 2014 explosives attack in the state of Jammu and Kashmir, which injured 17 people… terrorism designations expose and isolate organizations and individuals, and deny them access to the US financial system. Moreover, designations can assist the law enforcement activities of US agencies and other governments,” the US State Department notification said.